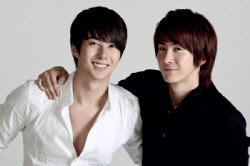 UKISS Kibum and his biological brother SS501 Hyungjun has come together for a shopping mall business. Usually as always, Kibum and Hyungjun who have been holding much interest in the field of designing had decided to do a character-figuring business using their own names, and this was decided in June. This character's name which they designed is titled 'Piro Piro', and it lasts an impression with its chubby cheeks and round eyes. Composition of the products are also very diversified which includes examples like cushions, neck pillow etc, and these are also expected to be for sale. Kibum has expressed, "I've always been interested in the area of designing, which is why I thus managed to do a business with my brother. I'm very excited and anticipating alot on our designed products that will go on sale soon", "What's left now is only the official launch of our shopping mall. We're now finished with concrete business preparations like the renting of our office, recruitment of staff, intaking of goods from the supplier factory, etc", "When samples of our products were finished, I got hold of it and showed them to my members, and I realized it resembled maknae Dong-ho. It'll be lovely if our offline mall could be opened too, we'll work hard for that", and in addition he revealed his determination as well where he "will work hard not just for business but also U-KISS activities too", and thus he asks for much of your anticipation and concern. U-KISS is in midst of active promotions with song [Shut Up], whilst Kim Hyung-jun is in high end preparations for musical [Cafe-in] that will open on 24th November.